As a teen, George began exploring nearby New York City, taking the train into the city to go to the 8th Street Bookstore. He loved poetry and great works of literature, as reported by his brother in his piece, ("Deep happy joy,") and his sister Joan ("Sharing his love of literature,") on this homepage. His sister Terry and cousin Mary Lanigan Regan told Substance about a “beatnik party” George hosted in 1964. 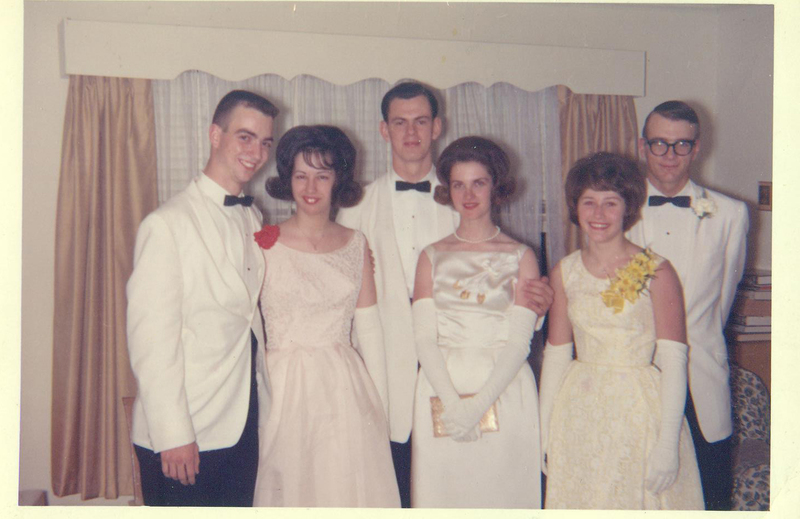 George with girlfriend Sheila Dorsey (at left) before prom in June 1964. George’s brother added the following: “There were lots of different people reading poems that they composed. Lots of people wearing berets too. And my mother checking every now and then to make sure that nobody was misbehaving. There were always clothes or towels drying on the clothes line ropes on the other side of the basement, so my mother could always create a plausible subterfuge for running up and down the cellar stairs. George dated several young women, especially Sheila Dorsey, who was one year older than him and used to pick him up outside his high school in her convertible. He had friends from his school in Newark and a best friend in the neighborhood, Maurice O’Callaghan. Beginning in his early teens, George lifted weights and competed in Olympic-style weightlifting events. As a child, and throughout his life, George was strong – physically, emotionally, intellectually – the one who would stand up to bullies. He was educated in Catholic schools, attending elementary school at. He obtained scholarships to St. Benedict’s Preparatory High School in Newark and to St. Vincent’s College in Latrobe, Pennsylvania, to study study history, poetry, and philosophy. After two years at St. Vincent’s, where he felt the academics weren't strong enough, George received a scholarship to the University of Chicago.